Florame is now available in Australia. 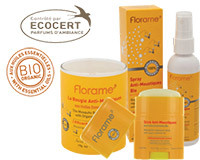 Established in 1990, France's leading independent Producer of Organic Essential Oils, Skin Care and Home Care products. Florame products cover eight product categories covering close to 300 individual product item. Since launching in early 2013 we are receiving positive reviews for the quality of Florame products. Florame has the maximum content of natural organic ingredients and contain no parabens, phenoxyethanol, silicon or GMO, no synthetic colouring agents or fragrances, no animal testing and 100% of our bottles and boxes are recyclable. Experts and pioneers in the distillation of 100% organic essential oil by selecting the best oils from around the world. Florame skin care products are composed of rare precious organic vegetable oils and organic essential oils, specifically chosen to the skin’s natural needs, as they react by restoring youthfulness, radiance, balance and protection. All Florame’s soaps, shower gels, shampoos and conditioners are delicately scented with organic essential oils and enriched with organic vegetable oils. The best organic seeds and cold pressed to preserve their virtues, Florame’s Vegetable Oils, all from Organic Agriculture, are genuine pearls of beauty. 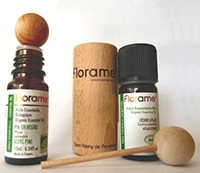 Organic Perfumes Florame’s Natural Vegan Perfumes are blended using ingredients that are 100% natural. Each perfume is certified organic by ECOCERT, the world's largest organic certification association. This range transforms the daily washing ritual into a moment of pure well-being and pleasure. To meet men’s specific skin care needs, Florame has created a compound that is a genuine concentrate of nature, with a blend of Cedar Oil and Argan Oil. Florame Organic Home products cover Cleaning, Anti-Bacterial sprays, Mosquito repellents and Home Fragrances all based on our 100% Organic Essential Oils. Please get in touch with Florame Australia and New Zealand from the Contact box on the right.